An amazing series from Michael Coleman, with sound breakdowns for lots of movies. This Prometheus breakdown is a great example of how the sound designers created sounds and recorded ADR for the movie. Maximising audio techniques for production. Over 3.5 hours long, this workshop with David Missall will teach you how to record better sound. When you’re filming an interview, the audio recording of the interviewee’s voice is the most important element of your production. Sam & Niko provide tutorials on Foley, Mixing, Sound Fixing, and more. This series is intended to help inform and guide beginner filmmakers to make the best videos, movies and shows they can. An introduction to in-field shotgun mics, lavalier mics and field recorders. The tutorial is shot at a noisy laundromat, which is a perfect way to show the quality difference of different microphones compared to on-board mics of DSLRs. A collection of user-made tutorials about microphones and recorders, and the physics and digital principles behind them. Web portal with information about art and technique of sound design. Site with articles, interviews, news and videos about sound design. Whether you're just getting started with Live or a pro looking for new tips and tricks, check out these tutorials. Record music in Ableton Live with our professionally taught video tutorials. In these courses, you'll explore how to create loops, make beats, perform live using Session view and software instruments. "Whether you've just started out, or have a full discography & millions of fans... there is something for every producer to learn on Sonic Academy"
If you know of any other great learning resources for sound recording and sound software, please email us and we will add them to the site. We’ve highlighted some of the better online tutorials for the platform below for anybody looking to learn a few pointers or polish their pre-existing knowledge. In this Ableton Live roundup, we look at some of our most popular and well-received music production tutorials from this year using Live and Push. The official Youtube channel for Ableton movies, tutorials, artist portraits and product info. Ableton Live tutorials on Youtube to suit beginner to advanced levels with our world-class instructors from Garnish. Although this site does its best to bring you quality Ableton Live tutorials, I think it’s about time we’ve compiled a list of our 10 favorite Ableton Live tutorial videos from around the web. Beginner and how to videos for learning how to use Ableton Live’s variety of functions. These cover the very basics of how to use and compose within Live. Learning a new DAW isn’t easy. Especially one as deep as Logic Pro X! That’s why we asked Logic Certified Trainer, Booker Edwards, to create this beginners' guide. This channel provides professional video tutorials for Logic Pro. 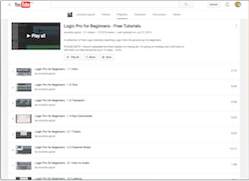 Lots of video tutorials for Logic Pro, from beginners to advanced. Envato is also a platform to buy and sell music and sound effects! In the Free Logic Pro video tutorials category you will find Logic Pro video tutorials from renowned trainers around the world. Record music in Logic with our professionally taught video tutorials. This paid course gives you a preview of the new features, as well as shortcuts for integrating them into your production workflow as quickly as possible. A collection of free Logic tutorials on Youtube, teaching Logic from the ground up for beginners. The Delicate Beats Channel aims at helping young music composers / beat makers / producers to take their game to the next level, by providing no-nonsense tutorials, sample library demos and information to record using Logic. Learn how to write, record, edit, and mix sounds to make the music you've always wanted. Watch hours of professional Logic Pro X tutorials online and get practical tips and techniques from producers who make music for a living. A Youtube channel with technical & tutorial videos on Logic for beginner to intermediate producers. I have learned all I know in logic by experimenting and finding out what each button does, by reading forums, and watching other tutorials. I try to combine all that I’ve learned into videos that make sense to the average user. This 35 minute video tutorial walks you through how to set up and work in Apple Garageband, so you can start making your own music! The latest iteration of GarageBand for Mac includes the Drummer feature. Learn how to use this excellent addition to bring a bit of rhythmic sparkle to your tracks. A list of Garageband tutorials for students from absolute beginners, to advanced. Youtube’s number one source for Garageband tutorials, home recording equipment reviews and a lot more! Turn your Mac into a recording studio. An extensive series of videos for learning Garageband. The official training course for GarageBand in PDF. This book is for everyone from the beginner just curious about music creation to the seasoned professional who happens to be new to GarageBand. Record music in Garageband with our professionally taught video tutorials. This paid course gives you a preview of the new features, as well as shortcuts for integrating them into your production workflow. A list of Cubase tutorials for students from absolute beginners, to advanced. Learn Cubase with us by following our video tutorials, where we show you how to record from start to finish. 20 Instructive tutorials on Cubase, Yamaha's digital audio workstation, which is produced through its subsiduary company Steinberg. Steinberg has been developing, manufacturing and selling software and hardware products for musicians and producers in the music, film, post production, and multimedia industries since 1984. 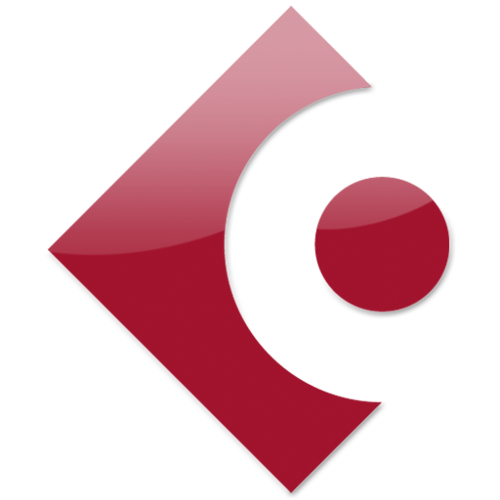 Cubase training videos, tips & tricks articles, and tutorials will teach you new Cubase skills online. Obedia is the resource for computer recording training and support. Obedia’s Youtube channel has tons of tutorials on Cubase. Pro Tools training videos, tips & tricks articles, and tutorials will teach you new Pro Tools skills online. Avid Pro Tools is the standard when it comes to audio recording and mixing. This VTC course explores these features along with the basics of operation. A series of articles on the ins and outs of using Avid Pro Tools. The Australian Institute of Music official youtube channel is filled with tutorials on Pro Tools. This channel is dedicated to free Pro Tools tutorials, specially designed for people who would like to learn Pro Tools from the ground up and/or explore the new cool features that are introduced in the latest Pro Tools versions! Obedia is the resource for computer recording training and support. 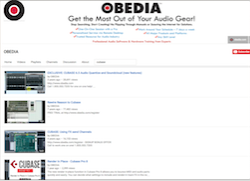 Obedia’s Youtube channel has tons of tutorials on Pro Tools. 11 tutorials that introduce how Pro Tools works, and takes you further into the deeper parts of the program. The tutorials are by people who know the program well: producers, well-known musicians, and a Digidesign product specialist. Clinton Harn guides you through audio market and equipment choices, theory and practice; from beginner to professional. A very technical article about different microphone models, with sound recording samples of short shotgun, super cardoid, hyper cardioid and cardioid microphones, recording patterns, noise ratios and more. Links to online learning resources for Sound Recording, Post Production and specific sound software. Today, the most fundamental audio issue of all, is control of loudness. This article explains the importance of loudness in audio recording.